The Shooting Break's gaping grille is a styling feature brought over from the SLS. STUTTGART -- Mercedes-Benz will reveal long-held plans for a CLS station wagon at the Beijing auto show on April 23 with the Shooting Break concept car. The four-door station wagon is among a series of new niche models Mercedes CEO Dieter Zetsche plans for low-volume production as part of an image-building strategy based around the German carmaker's new design language. Inspired by the two-door shooting brake genre made popular during the 1960s by a number of British-based carmakers, the Shooting Break concept provides clues to how Mercedes plans to extend the future appeal of the CLS sedan through the likely addition of a wagon variant with added practicality. "The Shooting Break is based on a tradition of cultivated sportiness," Mercedes Chief Designer Gordon Wagener says. "At the same time it points the way towards the further development of the design idiom of Mercedes-Benz." Mercedes-Benz remains tight-lipped on production plans for the CLS wagon, but official documentation reveals it has already been given the internal codename X218 – a clear signal that the Shooting Break is more advanced in terms of production readiness than its concept car billing reveals. At 4960mm in length, 1950mm in width and 1444mm in height, Mercedes' latest concept car has the same dimensions as the upcoming second-generation CLS sedan, making it 45mm longer, 75mm wider and 14mm higher than the first-generation CLS introduced in 2004. It also rides on a wheelbase that is up by 19mm at 2874mm. 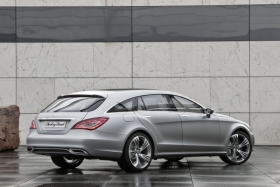 The current CLS is credited with breaking the design mold at Mercedes by boldly placing form before function. With the second generation Wagoner and his team of designers have created a bullish-looking car that, like its predecessor, is sure to stir controversy and divide opinion. The most striking element of the new car is its gaping grille – a styling feature brought over from the recently introduced SLS. Imbued with a single slat chrome insert and large three-pointed-star reminiscent of that gracing the company's classic 190 SL, the so-called soft-nose treatment is set to become common across the Mercedes line-up in coming years. The new grille is bookmarked by advanced new headlamps boasting full LED functionality for both dipped and main beam as well as day time running lamps and indicators. Set to become an option on the new CLS, they are aimed at providing the new car with a differing visual character between day and night. The Shooting Break has a unique plunging roofline, heavily angled rear window, top-hinged tail gate and large LED enhanced tail lamp. Holding true to the signature design features established on the first-generation CLS, the Shooting Break also gets a high set waistline and comparatively low roofline – a combination that provides for unusually short side windows in a look reminiscent of chopped roofed US custom cars. Also carried over from today's CLS are sheer, frameless doors with little to no shoulder effect and a prominent body side swage line – the latter of which combines with a distinctive crease line running across the muscular rear hunches for an effect that visually emphasizes its rear-wheel drive layout. But while the Shooting Break concept car provides solid clues to the front-end look of the new CLS sedan, its rear-end styling is completely unique with a plunging roofline, heavily angled rear window, top-hinged tail gate and large LED enhanced tail lamps extending well into the rear fenders. 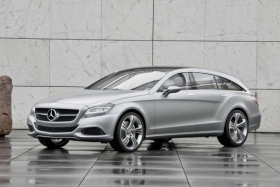 The second‑generation CLS sedan is set to be officially unveiled the Paris auto show in September. It will compete against cars such as the soon-to-be-revealed Audi A7 and recently introduced BMW 5-series GT.